Church bells have always had a special significance in Russia. Thanks to them people found out about all the most important events — from festivals to fires. When, after the revolutions of 1917, the Bolsheviks started destroying church bells, this was not just an act of vandalism, but an act full of a gloomy, mystical meaning. Russia had lost its voice and its hearing for a long time to come. Over the course of the rise and fall of the Soviet Union, Russian bells were silent: cracked, cut down and sent abroad, forgotten in distant corners of disused churches. 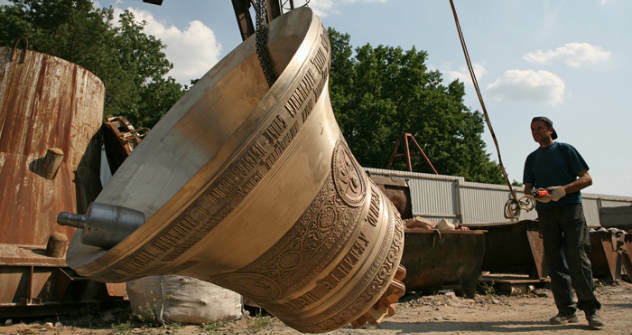 Yet until the October coup, the volume of bells cast in Russia had been as much as two thousand tons annually. By way of comparison, the largest bell in the world is the 200-ton Tsar Bell in the Moscow Kremlin. If in prerevolutionary Russia they had made only such gigantic bells, then every year they would have cast no fewer than ten of them! Today bell production in Russia is enjoying a renaissance. One of the centers where this forgotten art is being revived is the city of Voronezh. In 1989 the Voronezh entrepreneur Valery Anisimov opened his own foundry outside the city. Since then he has cast more than twenty thousand bells. Valery, now 55, named his foundry Vera (Faith), both in honor of his wife, and in honor of that Christian virtue. His long dark hair is tied back in a knot on the nape of his neck, in the manner of a monk; his beard is flecked with grey. Valery crosses himself every time he passes a church — and in Voronezh there are many. His speech is calm but forceful — hard to interrupt. He uses many Church Slavonic expressions: his foundry’s principal client is the Russian Orthodox Church. We are on our way to Shilovo, the village near Voronezh where Anisimov established his manufactory. Several workshops, an administrative building, furnaces for melting bronze, metal molds, a caterpillar crane and a huge bridge crane stained with rust to look old and moving along tracks with much creaking and moaning, as if this were the final scene in a Hollywood blockbuster. “What was here before?” I ask Valery. In the middle of the factory yard I see an enormous bronze bell weighing 1000 poods (36,000 pounds) — roughly the equivalent of four city taxi vans full of passengers. Workmen are swarming round the enormous bronze dome like bees round a piece of honey: hammering, scraping, and polishing. “In olden times they would spend up to six months finishing an ornamental bell, making it absolutely perfect. We need to do all that in one day!” says Anisimov. He seems to be angry that his customers give him so little time, but in fact he’s proud. He knows that his work brigade can manage everything in one day. Because of the sandblaster now in use, the entire space around the bell is covered with a sandy dust, just a little more, and this part of the factory will look like a beach, but a beach where no one has time to rest. We go upstairs to Anisimov’s office. The walls are hung with government and church letters of credence “for painstaking labor”, photographs with Patriarch Alexy II, a pilgrim’s certificate from the Holy Land. Near the door, on its own, hangs a state patent dated 28 June 1991 for the industrial model of “the upper part of a bell”, one of the last patents to be awarded to anyone in the Soviet Union. Not long ago Anisimov built a new workshop. He is planning to expand his business and to cast not only bells, but also propellers for ocean-going ships. A Lego model of his future production is standing on the windowsill. The first years of work were the hardest for Anisimov. He had to begin almost from scratch. He had no experience, no knowledge. He taught himself the technology of making bells from a book published in the early 20th century which he chanced on in Moscow’s Lenin Library. Today his bell production can be considered high-tech. The model of each new bell is calculated on a computer, while the icons drawn by artists in wax are scanned and put into the database, after which a laser machine tool engraves them in the size required on the prepared surface. Anisimov says that the bell business is not so much profitable as it is “good for the soul”. In order to go on working, he has to keep costs down. He doesn’t buy the expensive Western equipment that would make him a slave to the banks. Instead he builds similar equipment himself from old Soviet junk and strives to make that equipment work just as well. “I have to do everything with a tenth the amount of money that is typically required. For example, to load a super-heavy bell onto a truck you need to hire a Liebherr crane in the city at a cost of 650,000 rubles ($21,000) a day. Or you can hire five tractor drivers for 1,000 rubles apiece. In winter, we use sleds; we sprinkle the road with snow, haul the bells to the Don, load them onto a barge and send them to the nearest port. If I have a lot of large loads, then I buy a whole barge, and resell it later in Novorossiysk. Famous people — deputies, senators, governors — want to “lend assistance” in casting bells and have their name stamped on the bell’s bronze. That’s hardly surprising. After all, if there were named bells under the Russian tsars, why shouldn’t there be named bells under the current Russian government? Let their descendants be considered patrons of the arts and philanthropists. Having one’s name on a church bell is not like having one’s name on a campaign poster or being interviewed on TV, it’s practically a direct route to eternity, closer to God! Russian bells are heavier than European ones, and Russian bell ringers do not swing the whole bell, only the clapper. You see, if you swing a giant bronze bell with too much force, the belfry could collapse. The more massive the bell, the lower its tone and the farther its sound carries. It’s too bad that you can’t cast a bell heavy enough to be heard in Russia’s major cities where the charm of pealing church bells is drowned out by the noise of cars and construction. But so long as companies like Vera continue to exist, there is hope that at least in the monasteries and small towns of Russia the pleasing sound of church bells ringing will continue to make people glad. Nikolay Abramov. Bell ring in Moscow.